Counselling is a type of talking therapy that allows a person to talk about their problems and feelings in a confidential and dependable environment. A counsellor is trained to listen with empathy (by putting themselves in your shoes). They can help you deal with any negative thoughts and feelings that you have. 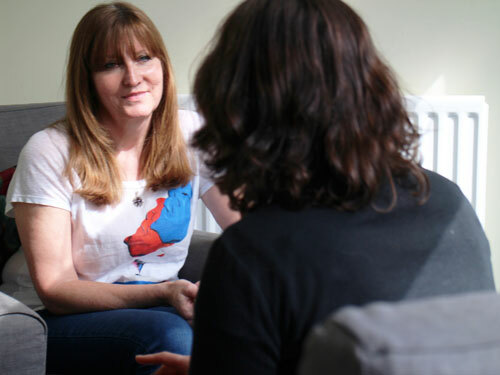 Sometimes, the term ‘counselling’ is used to refer to talking therapies in general, but counselling is also a specific type of therapy in its own right. Whether it is Counselling or another type of talking therapy which is provided will be down to the individual therapist and the client’s needs. CBT cannot remove your problems, but it can help you deal with them in a more positive way. It is based on the concept that your thoughts, feelings, physical sensations and actions are interconnected, and that negative thoughts and feelings can trap you in a vicious cycle. CBT aims to help you crack this cycle by breaking down overwhelming problems into smaller parts and showing you how to change these negative patterns to improve the way you feel. Low-Cost Counselling at the Stress Project is between £12 – £45 per hour session and is available Monday-Thursday. Evening and weekend appointments are also available. Please contact us for more information. If you would like to receive Counselling, we prefer that you ask your GP or health professional to fill in our referral form. Many health professionals have copies of these forms already, otherwise they need to contact us. My approach above all is warm and caring. I believe that the majority of the work is done through the therapeutic relationship, and thus try and work in a sensitive and caring manner to help build trust. Part of building a good relationship may also mean the appropriate use of challenges. These challenges can sometimes bring to the surface some difficult and painful material. Such material may surface under other conditions as well, but it is important that the client feels well contained. If the client feels safe and is held well by the therapist processing such material can have a therapeutic effect. I have trained in integrative counselling, which comprises of the psychodynamic, person-centered and psychosynthesis orientations. My approach is relational and follows the Clarkson 5-strand model: the working alliance, transference/countertransference, person-to-person, reparative and the transpersonal dimension. I am a trainee counselling psychologist, undertaking a doctoral programme at Regent's University, London. I see clients on the low-cost therapy programme at the Stress Project every Tuesday. My approach integrates various different forms of therapy to provide the maximum benefit to clients. The focus of the sessions is up to you - we can explore any aspects of the past, present and future, looking together at your relationships with yourself, others and the wider world. As your therapist, my role is to help you to feel safe, secure and understood. The aim of the sessions will be to help pave the way together for addressing feelings of sadness, anger, anxiety or fear, and managing life's 'givens' including freedom, responsibility, choice and finitude. All sessions are confidential. I am a qualified humanistic integrative counsellor with over 15 years of counselling experience and adhere to BACP code of ethics. I strongly believe that counselling helps when we feel that the demands of life seem to outweigh our ability to cope. Talking therapy will provide you with help to explore issues that may be affecting you. I provide you with a space to enable you to feel empowered and supported. We will work together to explore your feelings, whilst ensuring you are given every opportunity to just ‘be’. You can bring to the session any issues and/or feelings that you want to share. You will be listened to, and supported, throughout your counselling process and during your personal growth. vast experience of supporting adults, young people and children with a range of different issues. I have been working as a qualified counsellor at the Stress Project since 2008. I am a member of the BACP and am on their register of counsellors. I work as an integrative counsellor and use a person centred approach also using person centred art therapy when appropriate. I aim to work in an inclusive way with people of different backgrounds and cultures. I work in a respectful, open and flexible way, often working with a diverse client group addressing issues such as depression, anxiety, eating disorders, life stage changes and mental health issues. I also provide a low cost scheme for student counsellors and can offer short-term solution-focused work but am equally happy to look at issues on a deeper level working on a long-term basis. I offer empathy, non-judgemental safe space and genuine encounter to my clients. I believe in a equal therapeutic relationship in counselling - respecting and accepting you as who you are and to accompany you in your journey to where you want to go in your life. Therapy can help you to gain more awareness about yourself, your identity, and the patterns in life - encouraging you to remove the obstacles in front of you to achieve your potential through personal growth. I started as a volunteer counsellor at the Stress Project and I have been working with clients who’ve had mental health difficulties such as depression, anxiety, panic-attack, self-harm, suicidal thoughts - with underlying issues such as childhood sexual abuse, domestic violence, confidence issues, bereavement, work harassment, redundancy, unemployment, terminal illness, relationship breakdown, abortion, bullying and family relationships. I welcome people from every walk of life - who are willing to commit and can engage in therapy. I abide by the BACP code of ethics in my practice and have committed to regular and ongoing personal and professional development and have a regular supervision. I am a trainee counsellor currently finishing my Diploma in Integrative Counselling at City and Islington College. I see clients at the Stress Project on Thursday afternoons. My practice is Integrative, rooted mainly in Person-Centred and Existential theory. I think that it is very easy for us to live our lives in a way that doesn’t make us happy, and to forget or dismiss what is important to us and brings us joy. For me, therapy is about working with a client to enable them to examine their world and the way they are living within it - thereby opening up the possibility of change to more closely align their way of living with what they want their life to be. No life lived is not worth examination. My specialisms include working with bereavement, loss, searching for meaning in life, feelings of being in crisis, and LGBT issues. I am an Integrative Therapist drawing from Person Centred and Psychodynamic theoretical concepts. Through my experience I have found that a therapeutic relationship is unlike any other relationship and a huge aspect of this is Trust and Confidentiality. Through our journey together we can explore and identify things along your life timeline which will allow you to grasp a better understanding of who you are as a person and what it is you would like to achieve and where you will like to be in life. I have experience with working with a range of different clients covering a range of different issues and concerns, which could be but not limited to; Anxiety, Stress, Depression, Addictions, substance misuse unwanted thoughts, work related issues, student life, health related issues. relationships, family break down, social isolation, loneliness, life break down, self esteem, raising confidence and self belief, exploring sexuality, exploring spirituality, exploring identity and culture, unhealthy patterns. I am a qualified Integrative Counsellor and Psychotherapist and a Registered, and accredited, member of the British Association for Counselling and Psychotherapy (BACP). I am also a Verified Therapist with Plus Guidance. I hold a Master in Arts (MA) in Integrative Counselling and Psychotherapy and a Foundation Certificate in Counselling and Psychotherapy from Regent’s University London (RUL). Moreover, I entered the field of the mind by acquiring an MSc in Psychology from the University of Hertfordshire and my primary background was in nursing to where I hold a Diploma in Nursing. I work in an eclectic way, drawing from some of the major psychotherapeutic approaches like Psychodynamic, Existential and Humanistic. Therapy is challenging but I aim to work with you offering a safe and confidential environment. After years of clinical practice in the field, and having worked with clients from various backgrounds and ethnicity, I welcome diversity and rest assured that I will listen closely to your story and unique personal experience. I will not make diversity an issue. However, I welcome your story around it if you feel it has become an issue in your life. Your safety and protection are on the top of my list. Some of the areas I work with include; Depression, Stress, Bullying, Bereavement, Adoption, Family issues, Low self-esteem, Self confidence, Relationships, Career issues, Loneliness and worry.